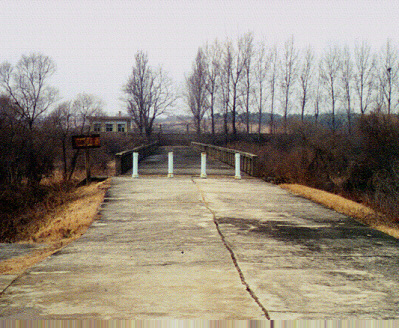 This is the "Bridge of No Return" near the village of Panmunjom that marks the border between North and South Korea. This was the last link that remained between North and South after the Korean War. Prisoners of war were exchanged here and some people were allowed to cross the bridge after the war. But it was a one way trip because after crossing they could not return. Soon after the war, the bridge and the border were closed and have remained closed now for over 70 years. Within a few yards of this bridge on this southern side, as late as the 1980s men have died because of incursions of North Korean soldiers across the border. The bridge is a desolate and graphic reminder of lost potential, of bridges that could be avenues of peace and understanding, but that remain barriers that are nothing more than monuments to human arrogance, ambition, and failure, blocking the way to a more promising future. One of the mottos of the CRI/Voice website from its inception is an adapted quote from John Wesley, "The world is my parish." Wesley wrote it in response to criticism that he was not staying within parish boundaries or in church but was preaching the Gospel to anyone, anywhere who would listen. I think his response corresponds to the Great Commission in both Matthew and Acts that calls followers of Jesus to take the Gospel with them into the entire world to whomever will listen. That kind of global vision is far more an achievable goal today than it was in 1739! Also, one of the important governing principles of the CRI/Voice, which I think arises from the heart of the Gospel, is the idea of Christian community and unity, so well expressed in John Wesley’s sermon, A Catholic Spirit. Amid clamoring voices all claiming to have the only true path to God, Wesley understood that such attitudes of contention and hostility are really a form of spiritual pride and self-righteousness masked under the façade of protecting the truth. That situation is even worse today where having the "correct" view about everything is considered by many to be the mark of "orthodoxy," yet very often overrules the biblical commands to love one another. I have had the privilege in the past few years of ministering in several radically different cultures around the world. I have talked to people from different religious backgrounds, from Hindus and Buddhists to Confucian philosophers to animists, atheists, and followers of Sun Myung Moon. I have visited Jewish synagogues, Christian cathedrals, Moslem mosques, Buddhist shrines, and Hindu temples. I have worshipped with Presbyterians, watched liturgical drama with Episcopalians, prayed in Russian Orthodox churches in Moscow, studied the Bible with Air Force Chapel parishioners, watched Charismatic Episcopalians offer prayers in liturgical dance, listened and watched a Native American Methodist give his Christian testimony in a Hopi Hoop Dance, shared Eucharist with Koreans, listened to Thai children sing of Jesus, heard sermons in Japanese, prayed with a Ukrainian pastor, taught Scripture to students from all over Africa in Kenya, and heard the testimony of God’s grace in the lives of formerly Moslem Kazhaks in Kazhakstan. I learned some things in all that. I learned, as the advertisement for Cathay Pacific Airlines said a few years ago, to respect a people means learning to value what makes them different. So, I learned to love kimchi, shashlik with fat, and to eat watermelon outside without spitting seeds. I learned to appreciate the crowds on Moscow's Metro and to enjoy the relaxation of long bus rides to Seoul. I learned different ways of bowing, not to use my left hand much, and to resist my Western manners of letting women go through doors first. I learned to value new kinds of bugs and long walks to the grocery store in the snow. I learned how to stop a taxi with a slight wave of a hand, and to stay out of the way of those same taxis while walking. I learned how cozy a heated floor can be and how miserable heat can be without air conditioning. I learned the technique of delayed listening as Japanese sermons were translated into English through Korean and as Kazhak was translated into English through Russian. I learned how to laugh at jokes long before I heard what the joke was. I learned to get by with co-ed bathrooms and to appreciate the logic of not wearing shoes inside the house. I learned not to notice the secret police quietly video taping us foreigners on Beijing's streets. But I also learned that beyond all the external trappings of culture and language, we are not all that different. Children everywhere laugh and play. It seems all boys like wheels, and girls like dolls and stuffed animals. Fathers and mothers everywhere love their children. People everywhere like good food (although perhaps Koreans know how to enjoy it more!). People everywhere appreciate beautiful things. People everywhere dream. People everywhere value friends. People everywhere hurt. People everywhere long for a better world, a world of peace where they can raise their children and grow old without the threat of war and violence. People everywhere yearn for a reunification of the divisions that tear humanity apart, symbolized so starkly near the village of Panmunjom by the "Bridge of No Return" that marks the boundary between North and South Korea. People everywhere need God. If we can so easily see the common threads that weave humanity together even in fragile ways, how it must sadden God to know that he created us for fellowship with Him and each other but that too often it seems to elude us. And if the divisions and hostility and hatred that so haunt our human existence are puzzling to us, how much more must they break the heart of God? Of all people in the world, we who claim to be the Children of God bear the responsibility of living out what God has created us to be, what he has called us to be, and what he has enabled us to be. I am increasingly convinced that the highest calling of Christians is not to evangelize the world by preaching or teaching or convincing people that we are right. I am becoming convinced that the highest calling that we have as followers of Jesus is to live out the love of God and neighbor in such a way that people will look at us, and say, "Look how they love one another!" It is not that we should abandon our commitment to spread the Good News of the Gospel to all people. It is just that too often our actions speak louder than our words. If we cannot bear witness of the Gospel in holiness of heart and life that exudes the love of God, whatever words we say will not matter much. And if people can see that in us, we will not have to say much! As Saint Francis is reported to have said as he commissioned his companions, "Go and preach the Gospel. If necessary, use words." Perhaps the quote is apocryphal. Yet it encapsulates the heart of the Gospel. I find it encouraging that the CRI/Voice website hosts Christians visiting from different Christian denominations and even from non-Christian religious traditions from over 100 countries around the world every month. Perhaps because of the rapid increase of communication technology and transportation, Wesley’s comments about a world parish have proven far more true than he could ever have imagined. Now, I think, it remains, given the increasing reality of a truly global community, that we as Christians work harder than ever on that other dimension of Wesley’s understanding of the Christian Faith, that of a catholic spirit, a sense of the universal brotherhood of believers. It is that spirit of unity that sees all Christians as part of the body of Christ, unified not by doctrines or ecclesiology or theology or nationality or tradition, but unified by grace! We have the opportunity, perhaps in ways that have never before existed in the history of the Christian Faith, to learn and to demonstrate daily that unity of spirit and of the Spirit to which Jesus calls us and modeled for us. The question is whether we will have the courage to lay aside our own egos, our own valued traditions that serve to define us but exclude others, and our own self-affirming sense that we posses the only truth, and allow God to transform our thinking to His perspective. Will we have the transforming grace of God so alive in us that we can see people through the eyes of God in ways that move beyond our own comfort zone that protects us but also isolates us from others? Will we dare open ourselves to the idea that taking up our cross and following Jesus in the role of a servant to the world may just mean that other people really are more important than our own ideas of what is right or true? Will we have the faith to trust God to use us for that ministry of reconciliation in the world as we surrender our self-righteousness to his righteousness, as we abandon our definition of God for His definition of us? I do not know. We human beings have always had trouble allowing God to change our cherished notions, because that would mean changing us. And we like who we are. We would rather he change others to conform to us. Or we take it upon ourselves to change them. I do not know what others will do. Finally, I am not responsible for their decisions. But as for me, I am willing to trust God with the details, and make that commitment to the primary goal of loving God and neighbor. I think, along with Wesley, that is the essence of a holy life. And I am convinced that in our modern world, on a practical level that means a world parish and a catholic spirit. May it be so, O Lord! Whose love my simple heart inflames. With Thee and Thine to live and die. And bow to Jesus' name alone. Who walk with God in purest white. The members sound who hold the head. Into the depths of Deity. And love their God with all their heart. As pure, as even, and as strong. To all Thy saints in earth and heaven.